Suggested Use: 5 tablets twice per day. Consult your health care professional. NAM (the abbreviation for “nicotinamide”) is one of several closely related nutrients that together are known as “Vitamin B3”. Since they are to some extent interconverted in the body, one can use any of them as nutrients to fulfill the basic need for this vitamin, which plays an indispensable role in energy metabolism. However, each form of the vitamin plays additional roles besides that in metabolism; these other roles depend on which form of the vitamin one uses. NAM, in particular, has long been known to be an anti-inflammatory, with anti-bacterial properties that have remained unexplained until very recently. These anti-bacterial properties are unique to the NAM form of the vitamin, and are not obtainable from other forms of vitamin B3. Despite the name “nicotinamide”, this form of vitamin B3 has biological effects unrelated to the tobacco alkaloid nicotine. They are chemically different substances; NAM has no addictive or habit-forming properties whatsoever. A significant portion of the population are long-term carriers of S. aureus. Since these bacteria are carried on the skin and in the nose, they are deposited on surfaces, handles, and railings everywhere, and exposure to them is impossible to avoid. Some strains of these bacteria can survive for hours to weeks, or even months, on dry or wet surfaces. The presence of S. aureus on skin or nasal passages does not always indicate infection or require treatment. But when infection does occur, treatment is needed immediately, since some infections proceed rapidly and devastatingly. S. aureus infections may spread from person to person by skin-to-skin contact with an infected person, or contact with objects such as towels, sheets, clothing, or athletic equipment used by an infected person. Prosthetic joints put a person at particular risk for septic arthritis, staphylococcal endocarditis (infection of the heart valves), and pneumonia. Since MRSA infections are difficult or impossible to treat with drugs, they can be extremely destructive to the body, and can result in amputations, major disfigurements, and death. First, the antibiotics that have until recent years been effective in treating staph infections have been used so widely and so carelessly, and for so long a period, that the bacteria have become resistant to them. Second, government regulatory agencies have put so many obstacles in the path of drug development that pharmaceutical companies have been discouraged from developing new kinds of antibiotics. Third, although the threat from MRSA has been foreseen for decades, politicians and medical bureaucrats failed to take the threat seriously enough; regulatory policy changes and research programs that could have averted the growing catastrophe were not undertaken in a timely way. Where does this leave the public? It leaves us to some extent having to fend for ourselves. We are starting to be overwhelmed by diseases that were thought to have been brought under control decades ago, and could have been kept under control had the medical and political system acted sensibly. Despite huge strides in understanding infectious diseases and their underlying genetic and molecular details, and despite paying vast amounts of money for medical services and medical research, the medical system is now scrambling to find ways to deal with this ominous situation, and many people are dying or being maimed by uncontrollable infections. Fortunately, a few very smart researchers are investigating alternate treatments for MRSA infections — treatments that are already available on the open market. In August of 2012 an article by Pierre Kyme, and colleagues, appeared in a medical journal describing the use of nicotinamide (NAM) to treat Staphylococcus infections.5 The article provides a detailed explanation of how NAM acts upon the genetic regulators controlling the body’s immune cells. These researchers showed that in mice with MRSA-like staph infections, NAM treatment reduced blood levels of S. aureus bacteria to one thousandth of the levels in untreated mice in less than 3 days. The treatment also worked in human blood samples infected with S. aureus. Is this an approved treatment? Research into NAM as a treatment for resistant staph infections is clearly in its earliest stages. It would therefore be premature to claim that it is a proven treatment for these infections. Nevertheless, the best evidence we have at this time clearly shows that NAM does stimulate the specific types of immune cells that fight these infections. Since NAM is available, affordable, and completely safe, it makes sense to keep some on hand in case of emergency. Rezistaf NAM should not be thought of as a substitute for seeing a physician about a new skin infection, but it can serve as a back-up in case a physician cannot see you immediately, or prescribes an ineffective antibiotic. How much NAM is needed to have a killing effect on S. aureus in humans? Pierre Kyme’s group discusses this question in some detail. They conclude that a dose of about 5 grams per day (80 mg/kg/day) would be reasonable, given the limited data available at this time. NAM is quite safe to consume at considerably higher doses than this, so there is little reason to worry about toxicity. 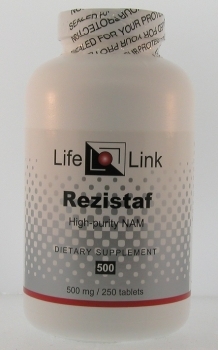 The 5-gram daily dose (10 tablets of Rezistaf) should be divided into two or more portions consumed hours apart. Although NAM is used as an immune-system stimulator, not as an antibiotic, the same rules apply: do not discontinue NAM usage as soon as visible signs of infection diminish or disappear (assuming that they do diminish). Unless the staph bacteria are completely gone, the remaining bacteria may make a come-back, and these will be the staph strains that are more resistant to your immune system. Since you should be consulting a physician, and probably using an antibiotic treatment in conjunction with NAM, your physician should be able to tell you when it is safe to end the regimen. Be prepared for a regimen lasting 30 days, perhaps longer. That means at least 300 tablets of Rezistaf at 500 mg each. J Clin Invest. 2012 September 4; 122(9): 3316-3329 C/EBPε mediates nicotinamide-enhanced clearance of Staphylococcus aureus in mice Pierre Kyme, et al.